Any Windows 8 users among our Japanese learners? If so, good news! So far our highest rated Japanese vocab-building app, WordPower Japanese, has been available for the iPhone, iPad, Android and Mac. The feedback was great, too! But there haven’t been Apps for PC or Windows users…‘til now. 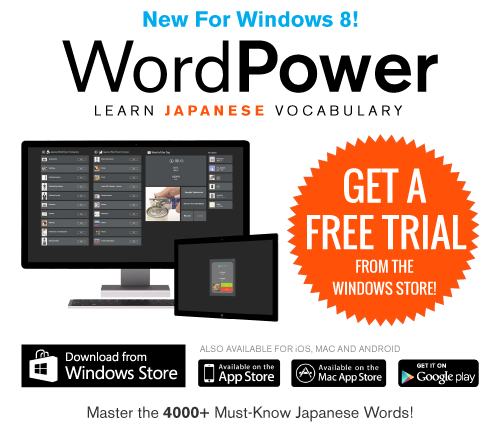 WordPower Japanese is now available on the Windows store for $9.99 and includes a FREE Trial. You master the top 4,000 Japanese words necessary for daily life and real conversations on your PC, Tablet or Windows Phone. How’s it done? Click on the link below to get a FREE Trial or keep reading for the full run-down of this App! Get a Free Trial & Download WordPower from the Windows Store! Language experts say you need about 1,500 words for conversational fluency. You get over 4,000 words in WordPower Japanese for Windows. Here’s how you master them with 2 easy study modes. WordPower breaks these words down into easy categories and courses. Business, Health, Food, School, Work, you name it! Choose one to start with and level up! You get the meaning, the native pronunciation and sample sentences, and even get to record yourself to compare. As you learn new words, WordPower tracks your progress. And if you’re interested in the details, here’s exactly what this Japanese learning app comes with. 4,000+ Must-Know Japanese Word List: The most essential Japanese vocabulary with spelling, translation, pronunciation, image, class, kanji and romanization. Top 100 Japanese Culture List: A special list of words specific to daily life in Japan. Thousands of Sample Sentences: Get sample sentences with every word entry. 2 Study Modes: Course Mode or Category Mode: Choose a course or category and work your way up as your progress is tracked. Easy to Use Design: Intuitive Windows 8 swipe navigation allows visual learners to browse vocabulary images quickly. Control your study sessions: Mix up question types (recognition, production, audio and visual) for a full understanding of each word. Listening Practice: Hear each word’s proper pronunciation by a native speaker. Perfect your Pronunciation: Compare your pronunciation to the native speaker’s with the Voice Recorder, easily accessible throughout the app. Personalized Word Bank: Save difficult or useful words to review at any time. Advanced Search Function: Search entire database in English or Japanese. Progress Bar: Keep track of how many words you have really mastered. Word View Options: Romanization and Kana Transliteration can be turned on and off. Free Japanese Lessons: Access the newest JapanesePod101 lessons for FREE! Basic Resources: Want to explore the Japanese language even more? Learn everything you need to know with this comprehensive source of Japanese learning tips, information and material. If you’re a Windows 8 user, make sure to try WordPower Japanese for FREE! A free trial is available when you get the App from the Windows Store. Or, get it for $9.99 and master the top 4,000 Japanese words. Remember: know more words, speak more Japanese. Click here to download WordPower Japanese from the Windows Store. P.S. WordPower Japanese is available for iPhone, iPad, Mac, Android and Windows, and FREE versions are available too! Click here to see the WordPower Japanese Apps and learn more!